The San Francisco-based artist builds metal sculptures that function to fulfill their own needs of existence. 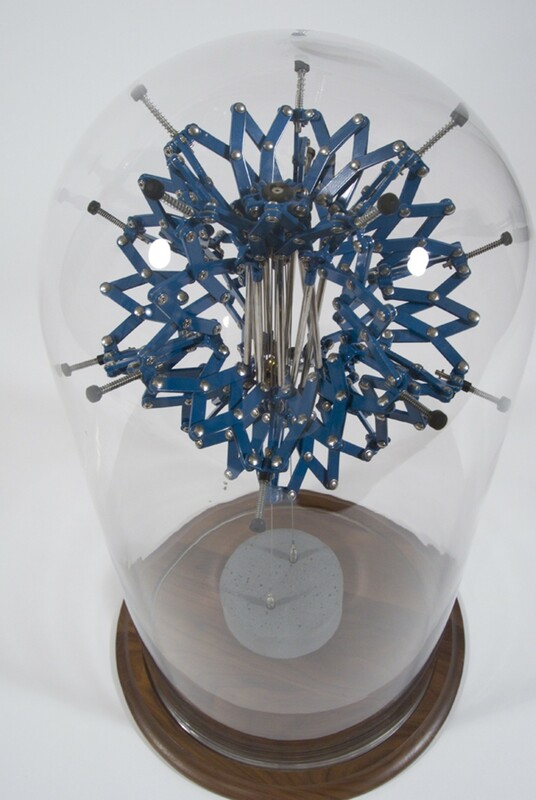 Dan Grayber's "Cavity Mechanism #12." 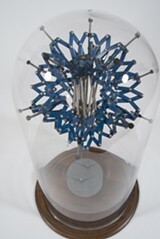 Dan Grayber's mechanical sculptures function solely to fulfill their own physical needs of existence. The metal contraptions look almost like toys, almost like tools, and almost like antique space technology. Grayber uses physics and mechanics to bring geometric drawings into three dimensions, blurring the division between sculpture and mechanics. Using steel bars, pulleys, wires, and cement blocks, among other materials, he assembles each part into a harmonic relationship, telling a story of push and pull that situates itself tensely within a glass casing. These are the works now on view at Johansson Projects (2300 Telegraph Ave., Oakland) alongside paintings by Steuart Pittman in the show Formalities. 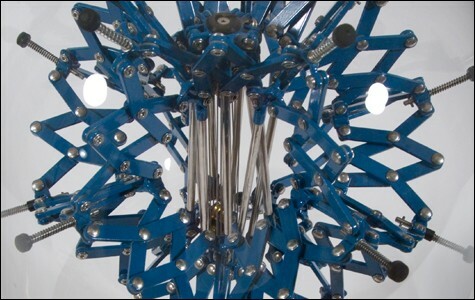 During an interview in the gallery, Grayber explained that he came up with the idea of creating contraptions that represent self-resolving problems when he was an undergraduate in art school at Hampshire College. There, while dabbling in design and invention, he became frustrated by the contrived nature of product design and the process of creating goods that seemed completely useless. He decided to take this concept a step further and design contraptions that ignored human need entirely, focusing only on their own functional requirements in a sculptural statement of autonomy. He began by building mechanisms that fit into specific architectural features such as corners or cracks in a wall. Incorporated into their environment, they intricately elaborated on architecture like robotic spiders perched on geometric, steel webs. Eventually, however, feature-specificity proved inhibiting to the display of his works. This limitation inspired Grayber to begin building terrariums for his creatures. All but one of Grayber's pieces in Formalities inhabit these contained environments. Reminiscent of the presentation of artifacts in a museum, the glass encasings give the impression that one is beholding something ancient, sacred, and out of use. "When I think about a display case I think about inanimate objects, dead things, dolls, things that are at their last resting point, so I just kind of like the idea of these things that are just kind of trying to keep themselves up in there," said Grayber. As a metaphor, the sculptures could operate as comments on meaningless materialism, or even, more broadly, on complex societal structures that operate under self-indulgent principles (think government shutdown). But, for Grayber, it's simpler than that. "As a metaphor, I think it's closer to the human condition of just trying to sustain oneself," he said. Different pieces represent various past emotional struggles for Grayber. In the gallery, the sculptures coexist in an unlikely harmony with Pittman's abstract minimalist paintings that present arguments in bold colors and sparse, simple shapes. This congruity establishes itself in the complementary palettes employed by the two artists, as well as the shapes represented. Despite their obvious contrast in complexity, each aesthetically portrays a pleasing impulse toward geometric harmony. Formalities runs through November 14 at Johansson Projects. 510-444-9140 or JohanssonProjects.com.